Home > Automotive Belts > Automotive Serpentine Belts. PK, K Section Poly V > 6PK710 Automotive Serpentine Belt. BANDO EPDM 6PK710. 6PK710 Automotive Serpentine Belt. BANDO EPDM 6PK710. 6PK710 EPDM Serpentine Belt. HEAVY DUTY EPDM Automotive Serpentine Belt (Micro/Poly-V). PK (K) Section. Metric 6PK710 Serpentine Belt. CUSTOM: 710mm Effective Length, 6 Ribs. BANDO USA “PK” Premium EPDM Automotive Serpentine (Micro V) ribbed belts are designed to replace OEM belts on SELECT MINI COOPER automobiles when the air conditioner unit is removed. 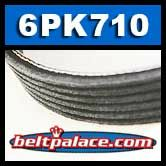 6-PK710 Serpentine Belt. 6PK720 Poly V Metric Automotive Belt. 28.3" Effective Length (720mm), 6 Ribs. Replaces Gates K060288 MICRO-V BELT, 283K6 Poly V Belt (metric).